When you imagine your first interview with a new company, most of us picture sitting in a conference room with three to four interviewers. However, more and more often, organizations ask candidates to participate in various types of interviews to assess how they will fit in with their team. One of those is a phone interview which is often used as part of the screening process. Unexpectedly being asked to participate in a phone interview, can throw your nerves; use these tips to keep your cool and secure your spot in the next round of interviews. There may be instances in which an interviewer will call you wanting to conduct the screening interview by phone right at that moment. If this happens, no one will fault you if you politely decline. Saying “I am away from my desk right now and will not be able to give this the focus it deserves” and asking to reschedule for another time is an appropriate response that shows your professionalism and commitment. Like a traditional interview, demonstrate your interest by preparing ahead of time. Research not only the company but also your interviewer if you are aware of who he/she is ahead of time. LinkedIn is a great resource that can provide you with a lot of information. Use this research to formulate some specific questions to ask during your phone interview. Again, this shows you are prepared and enthusiastic about this opportunity. Practice your responses to common behavioural interview questions. Say your answers out loud so you know what you want to say and how you want to convey your response. Keep your resume, cover letter, and the job description in front of you, and use them to keep you focused and on point when answering questions. Additionally, make a notecard with points you want to emphasize and questions you want to ask prior to the phone interview. 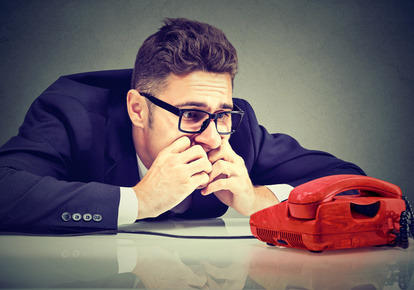 Your tone holds a lot of clout in a phone interview. The interviewer does not have your face or body language to pay attention to; therefore, it is imperative that your voice evokes positivity and confidence. A smile carries to the tone of your voice so, as you are answering the interviewer’s questions, remember to smile. Be sure to send an email (or regular mail) note to your interviewer thanking them for their time. If thanking them via email, avoid sending it immediately after the interview, but do send it on the same day. In this note, thank them for their time, confirm your interest in the company and your ability to do the job. Remember: A phone interview is a step in the process of landing the job you want. Take it seriously and prepare just as you would for a traditional interview.